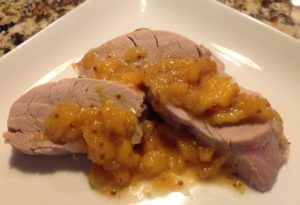 I was making a pork tenderloin for a dinner party and wanted to enhance it and a peach chutney was the perfect accompaniment! However it would be great for chicken and other proteins as well. You can make it ahead of time and warm it up before serving, which make for an easy dinner party or even a weeknight meal. I am using Peach Aged White Balsamic Vinegar from Spicewoood Food Company and can be purchased on-line at Spicewood. To make Peach chutney, peal and dice peaches and add to a medium sized sauce pan along with the olive oil and sautee until slightly soft. Add wine, mustard and salt and pepper and simmer for about 15 minutes. At this point the peaches should start falling apart and if not you can always use a masher to make it less chunky. After cooking, stir in peach vinegar and set aside or make the chutney while pork is baking. To cook pork, season with Kosher salt and pepper and add olive oil to a large skillet and sear on all sides. Transfer to a baking sheet and bake at 375 degrees for about 30 – 45 minutes or until done, meat thermometer should read 145 but I generally take out at 140 and the temperature will raise to 145 while it rests. Let pork rest for about 10 minutes before slicing to retain juices. Slice pork and serve with pork tenderloin as shown or your favorite protein or store in a container in the fridge.